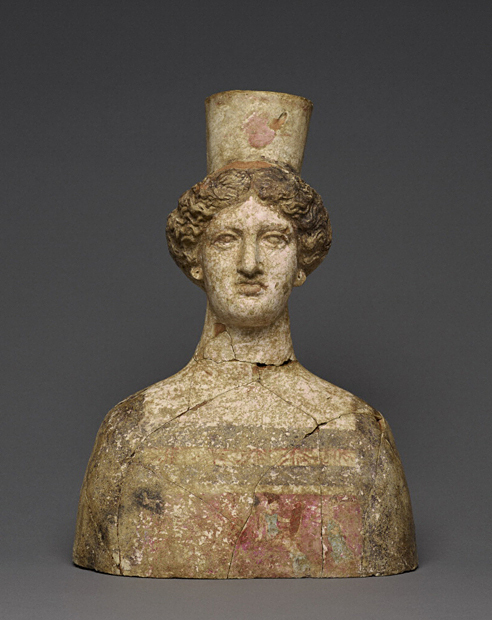 Morgantina has not produced a large number of statues to date – but what has been recovered bespeaks the importance, connections, and wealth of the site. In addition, a fragmentary limestone statue of a draped female was recovered from the Agora and is being studied by Malcolm Bell. Morgantina produced innumerable terracotta figures of all sizes, including fragments over-life sized from the same sanctuary in San Franceso that produced the acroliths. Though unpublished, some of these are on display in the Aidone Museum. The terracottas were published by Malcolm Bell in Morgantina Studies I: The Terracottas (Princeton 1980). Some of the most remarkable are currently at the Getty Museum in Malibu, until Jan. 2013.